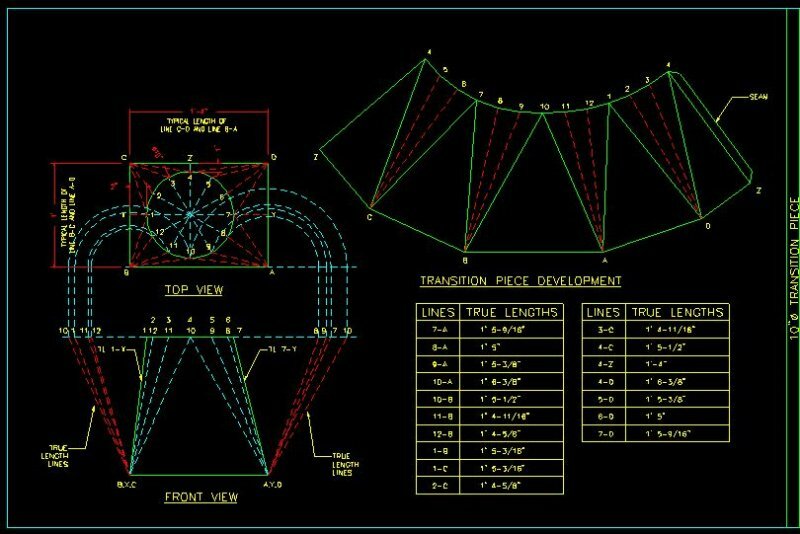 I am trying to draft the 10x1406 hvac pattern and 10" diameter transition piece. Can you please post an image of them. Post of image of what you have so far. Is this a Penn-Foster project? Are these the ones that you are trying to do? Remember that your project may be different. yes they are. thank you car5858. We are to do 2 pattern developments in which the front views show the transition's larger side (14" wide) and 2 pattern developments in which the front views show the transition's narrow side (10" wide). My first 2 pattern developments look similar to CAR5858's post #3 top two. But, I am stuck about how to start the other two. What do the 2 bottom pattern developments of Car5858 show. Can someone post an image of how the narrow side (10" wide) should look, or am I missing something? This is a little complacated, but you can see the development process. First find the true length of line 3-4 (red dashed circle), next find the position line 2-3 (cyan circle). Since lines 2-3, 3-6, 6-1, and 1-2 represent the narrow side, these are at the top of the flat pattern (see screen shot). 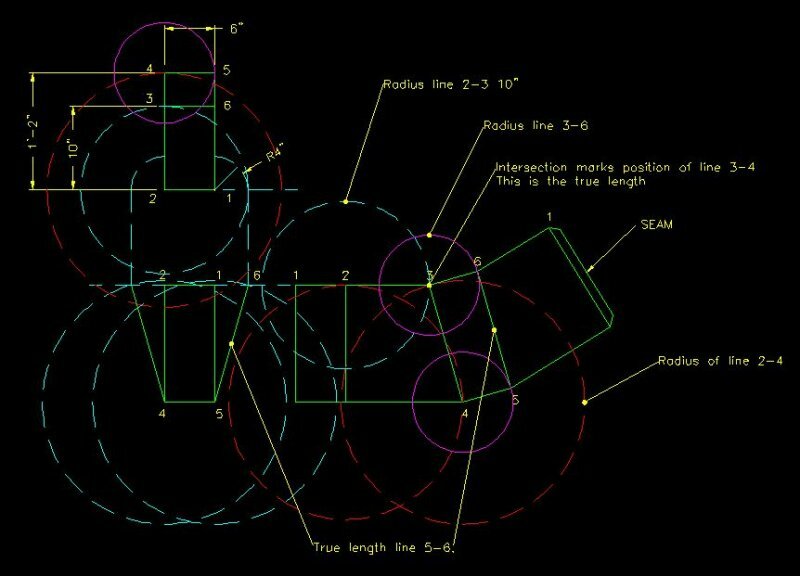 Use the circles to lay out the flat pattern. By positioning the circle radius at their respective point, the intersections of the circles create the end points of the stated lines. Thank you so much CAR5858!! hi, does anyone have a screen shot of plate 1 for the HVAC. I am only using autocad 2008 as my laptop with 2010 crashed. Thank you. Wendymoose, you should be starting a new thread with your question. Use Penn Foster HVAC plate one as the title. 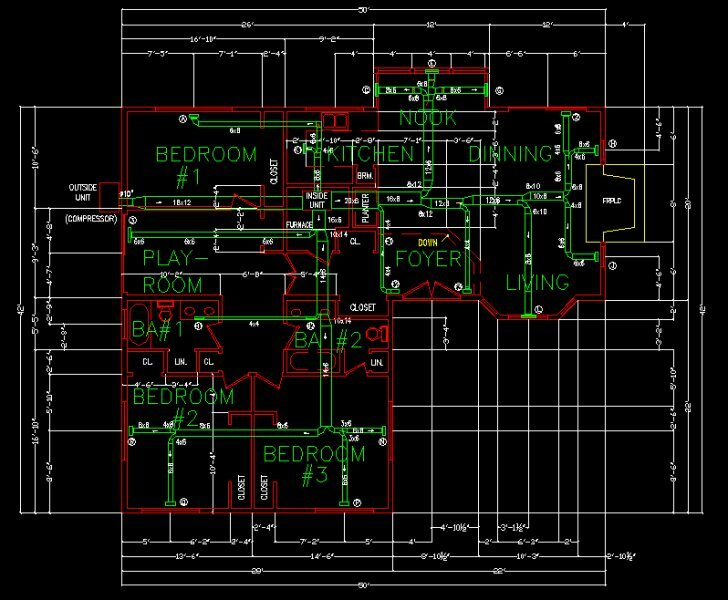 Plate one is the floor plan with the ductwork. Do you have the floor plan completed? Are you stuck on the duct layout? The instructions were pretty clear in this section. I did not have a problem with it. You will also have to add a table to the right of the drawing. This is explained in the instructions. wow, thank you Tankman. I know that with practice I will some day be able to do all of that without even thinking. I am trying. Thos drawings sure do make a whole lot of sense. I appreciate that. car could you please post a shot of plate A of hvac drawing. Yours is blurry when i zoom in on it to see how you do the bends and transitions of the duct. Plate A? I thought the HVAC project had plates 1 through 3. Which post is the image in that you are referring to? it is the post on page 1 where car provides screen shot of plate 1(sorry). I just can't see the details on his drawing for the correct placement. the screen shot is blurry when zoomed in. Plate 1? I'll see what I can do. Any better? yes it is a tad bit better. I was wondering where did the kitchen sink come from? There was nothing i read about the sink or it's dimensions. Carr and yourself both had it on the plate as well. Disclaimer: I did not take the Penn-Foster AutoCAD course. Drawings or portions of drawings that I post were created by other students. A tad better? What are you reading these on a cell phone screen? I suspect that any "extras" not specifically called for in the instructions were added by the student looking to give the drawing a more finished look. yes slightly better and no im not reading on a cell phone. it is on my computer when i open the link it gives me a screen shot of approximately 6x6. when i zoom in it becomes distorted. The sink situation i understand. Take a peek-a-boo and, good luck with your studies.